The DCS-5300 Pan/Tilt/Zoom Network Camera connects to an Ethernet or Fast Ethernet network to provide remote, high-quality video and audio monitoring at a cost-effective price. 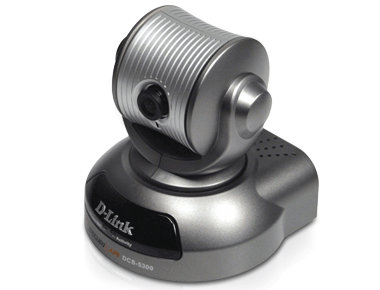 Remotely watch and listen with the D-Link Securicam NetworkTM DCS-5300 Internet Camera. The DCS-5300 Internet Camera is a full-featured surveillance system that connects to an Ethernet or Fast Ethernet connection to provide high quality video and audio over the Intranet or the Internet. The DCS-5300 Internet Camera differs from a conventional PC Camera because the DCS-5300 is a stand-alone device with a built-in CPU and Web server that allows you to access your camera using Internet Explorer 5.X or above from anywhere in the world. 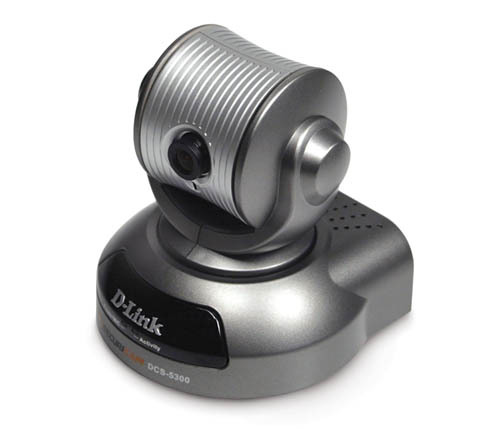 The D-Link DCS-5300 Internet Camera also has a pan, tilt, and digital zoom function that can be controlled from the Web interface or from the included remote control. Auto pan mode enables the camera to move 270 degrees horizontally and the Patrol mode cycles through up to 20 preset positions. The speed of either pan or tilt can be adjusted to your preference. The 4x digital zoom lens enables the camera to obtain a closer view. The D-Link DCS-5300 Internet Camera comes with a CCD sensor that provides a sharp and clear image with life-like color representation. The sensor is a CCD sensor with resolution of 380 TV lines. The built-in microphone adds sound that accompanies the video. Altogether, you can record streaming video with sound that utilizes high quality MPEG4 Short Header Mode Compression to your hard drive, enable motion detection, and set up automated e-mail alert notification. A powerful surveillance software is included to enhance the monitoring and management of your DCS-5300. The bundled surveillance software further enhances the security features of the DCS-5300, allowing you to archive streaming video and audio straight to your hard drive, playback video, monitor as many as 16 cameras on a single screen, and set up motion detection to trigger automatic recording. By signing up with one of the many Dynamic DNS services, you can assign an easy-to-remember name and domain (e.g. www.mycamera.myddns.com). This allows you to remotely access your camera without having to remember the IP address, even if it has been changed by your Internet Service Provider. The DCS-5300 Internet Camera is a Price/Performance breakthrough, feature rich solution capable of meeting demanding security and home/office monitoring needs. Secure your site with the D-Link Securicam DCS-5300 Internet Camera. Do NOT upgrade firmware on any D-Link product over a wireless connection. Failure of the device may result. Use only hard-wired network connections. This firmware is engineered for Indian products only. Using this firmware on a device outside of India will void your warranty and may render the device unusable. Please contact the D-Link office in your region for firmware updates that are compatible with your D-Link product.